I wish I wasn’t always so earnest with medical professionals. When my doctor suggested a few weeks ago that I take a test that offers breakfast, I jumped at the chance. Breakfast is my favorite meal of the day and my insurance company is going to pay for most of it? Works for me! Of course, the only catch is that I will be slightly aglow for a little while afterwards. How long afterwards? Well, they weren’t very clear about that. The good doctor said between 24-48 hours only, but the above sign which greeted me on the morning of the test clearly says otherwise. Maybe it’s time we end that little charade about how only women can glow, eh? I’m actually hoping that some of the radioactivity will remain in my system for a while longer. 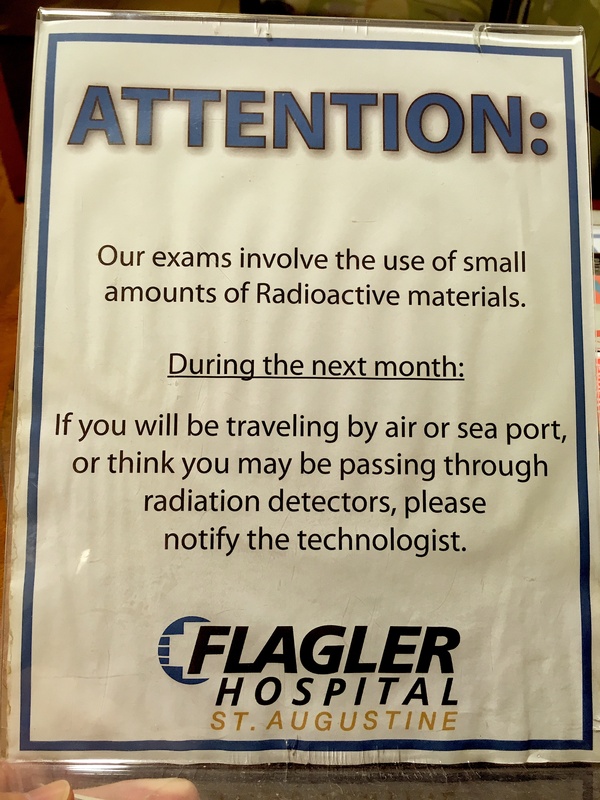 Without a scintilla of medical evidence to back this up, I’m thinking that radiation just might help one particular area of my body to expand a little. Gorgeous has been complaining recently that my gluteus maximus area is shrinking. She’s apparently not the only spouse with such a predicament. No sooner did she make this observation then the very next day a fellow blogger posted on the same phenomenon happening with her husband also. Honestly ladies, aren’t there worse things to complain about? So my doctor arranged for me to have a gastric emptying study at the local hospital because we’ve indeed noticed over the last few of years that I’ve been having a problem keeping on the weight. We tallied up a 15 pound weight loss starting from the time I retired four years ago, and it was enough for Gorgeous to motivate me to have it checked out. She’s not fooling me, though. I know this is all about my crossing a very specific red line of hers: she won’t accept any instance where I begin to weigh less than her. In addition to my propensity of being positionally-challenged with the bathroom toilet seat, and also a reflexive impulse to shush whenever Genesis plays on the car radio, I assume this weight loss is another “habit” of mine which she deems intolerable. I should have seen this all coming. Earlier this year I mischievously tried on some old jeans from the furthest reaches of my closet. A black pair from LL Bean, size 32 waist, they were purchased at some point in the nineties, but I probably stopped wearing them by the early 2000’s. I kept them all these years in the vague hope that perhaps someday they might fit again. To my utter shock they now do! I was ecstatic; Gorgeous not so much. Over the course of the summer we noticed that while I still had a decent appetite, I would be full and bloated several hours after eating. The only way to insure that I wouldn’t feel this way was to eat smaller portions. Smaller portions are good right? We’re all told now in countless of articles and health news reports to eat less. But after yet another loss of 3-4 pounds by the end of the summer, I finally agreed that I should visit the doctor to discuss. I was promptly sent for a full battery of blood labs, all of which came back with readings firmly in the normal ranges. Neither of them were impressed. Out-voted and out-maneuvered, I watched as the doctor filled out an order for this gastric emptying study with a referral to a gastroenterologist to go over the results. He was washing his hands of me. I decided not to read much about the study ahead of time. This was mostly out of laziness but also a desire to stay somewhat ignorant. The less I knew, the less I might stress about it. The hospital instructed me not to eat or drink anything after midnight and to arrive by 7:00am the morning of the procedure. The actual breakfast I was served turned out to be disappointing. It was scrambled eggs and toast served with a radioactive-isotope reduction sauce. They messed up my order too because I specifically asked for that sauce on the side. There were also no potatoes, danish, or fruit. When I pointed this out to the waitress she just laughed. We’ll see who’s laughing later when I write my review on Yelp. 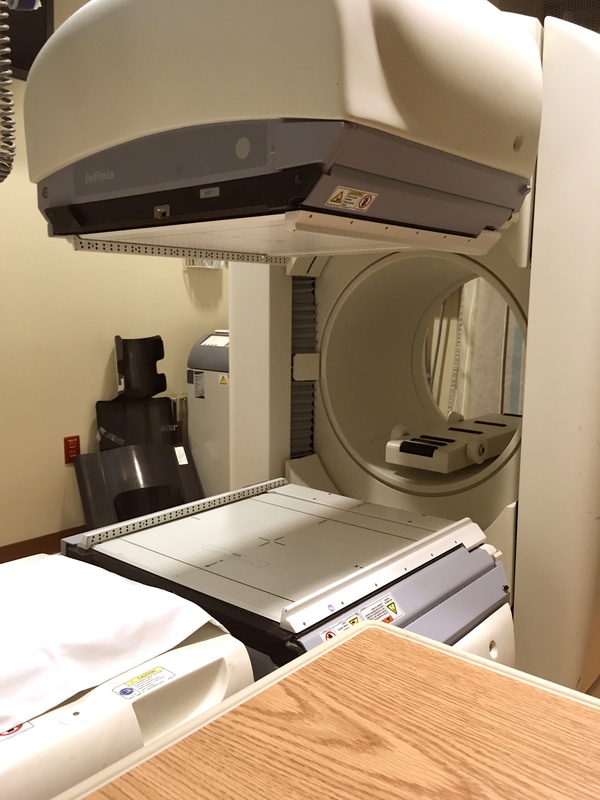 After I finished eating, I was taken to an open-ended machine outfitted with a Gamma Camera. My waitress, who apparently also doubles as a medical technician, explained that the gamma camera takes images as the radioactive food as it moves through my stomach, and it detects gamma rays emitted from that food. A computer then produces pictures and measurements of my stomach for the gastroenterologist to review later. I was instructed to lay still on the machine’s platform for an hour as the images are taken. There’s just one problem with that: I am a bit of a claustrophobe. While my upper body was outside the actual chamber itself, I was told to lay still and try not to move around too much so that the images are captured correctly. I asked the waitress/technician to define “too much” but she just laughed and said not to worry. Again with the laughter! I was allowed to use my arms and hands since they were outside the scanning area, and so I could use my phone with headphones to listen to music. First I listened to a news podcast, but that only proceeded to get me upset at what I was hearing. Dumb move on my part. Then I switched to songs but kept skipping through them. Beatles? No. Stones? No. Indigo Girls? No. Aretha? No. Roger Eno? Ah… bingo. ‘Ol Rog got me relaxed enough to finish out the procedure without too much mental angst and squirming. For those curious, I do recommend his “Voices” album from 1985. It’s very calming. 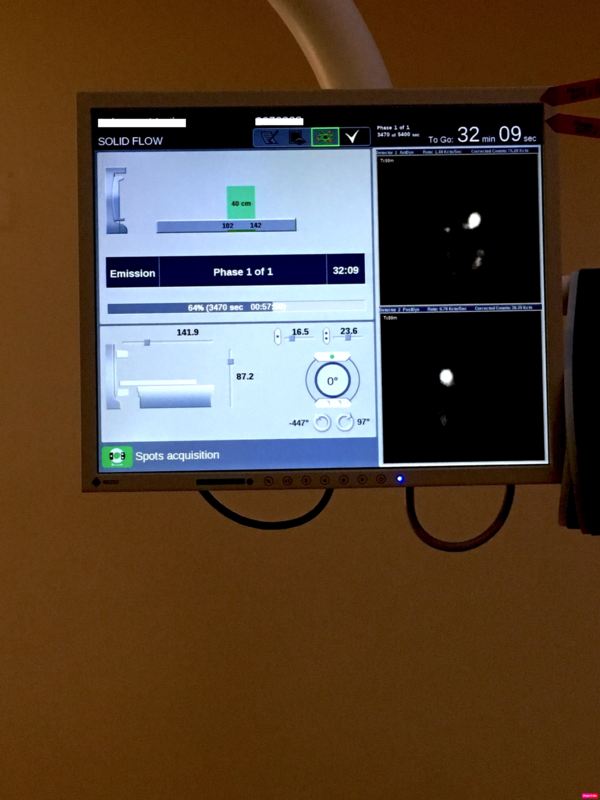 Next to the machine was a monitor which portended to show the images of the food making its way through my stomach. I found this hard to believe. I’m laying flat; how can I possibly digest food while laying down? I get indigestion when I merely lean back on a sofa too soon after a meal. It seemed impossible. The other reason I found the images confusing is that they look pretty much like what every expectant mother has ever shared with me from her sonogram photos. For G-d sakes, I’m not looking at food; that’s a fetus. I’m pregnant! Boy our girl? You decide! The result of the study ultimately showed that I have no problems processing food. Once again everything appeared normal. My gastroenterologist ultimately decided that he needed to perform an upper endoscopy. The results conclusively showed an abrasion in the lining of my stomach that is pre-ulcerative. This has made my stomach inflamed and irritated which explains why I am always feeling bloated and full. The most likely cause of this is over-usage of ibuprofen on my part. The amounts I’ve taken have never been excessive, but over time it’s had a cumulative effect. I was ordered to switch permanently to acetaminophen (i.e. Tylenol) for pain, and have been given Protonix to relieve the symptoms. It’s been about two weeks and already I can feel a difference in how I’m digesting food after a meal. Fingers are crossed. So do be careful about the amount of Advil, Motrin, etc., that you take. I’m looking forward to enjoying slightly more food at meals again. And if I’m really lucky, I might just have a little more “heft” back at the caboose. I’ll also let you know where I’m registered well in advanced of my pregnancy next year. Better put those jeans from the 90’s back in the closet. Better yet, in the donate pile! Glad they found something. The worst thing of all is when they find nothing and tell you it’s stress. I seem to get more sick around election time. Go figure. Thanks for the link. I was aware of the dangers of overuse, but a pharmacist neighbor of mine once told me that I’d have to take it huge amounts for it to really do any damage. I guess I found too much comfort in that advice. Fortunately we nipped this just in time before anything truly bad developed. I can’t take aspirin because ironically it upsets my stomach. 🙂 Go figure! Good lord, a hundred. Mine was two at a time but accumulated over years, I guess. You’re probably okay. I think everything we take, eat and drink is slowly killing us anyway. Pesticides, hormones and poison dumped into water supplies…yowsa! If it’s not one thing it’s another. Taking meds of any kind is ‘a damned if you do, damned if you don’t’ experience. I hate those stomach tests. Never pleasant. I’m sorry you went through all of this. Many thanks. I’m philosophical about it all. Just this week I had my annual with the urologist about kidney stones, and he said that scans they took in his office on that visit show no signs of any new stones to worry about. I’m good for another year. So I figure I’m “Even Stephen” in all of this. BTW – I’m with Kate and Gorgeous. Get rid of those jeans! I’m sending a pic into GQ just in case they’re interested! Thanks, Donna! Thanks, Vy! I think it was all pretty much caught in time, and now it’s mostly a case of making sure that the “plumbing” can now mend properly. But, yes, it bugs Gorgeous to no end how I can eat anything and never gain weight! Haha! So glad I found your corner of the internet! I recently retired from teaching for over 30 years and hubby is retiring next month. I also complain about his, um…gluteus maximus shrinking, but you are right – there are worse things to complain about! 🙂 Loved your post! Thanks, Laurie! Yes, I’m told there is a progressive change to that part of the anatomy for men as we age, which isn’t always received well by their spouses. But I’m thinking it still must be better than having the opposite size start to manifest. Bigger isn’t necessarily better! Radioactive Breakfast would be a good band name, I reckon. Or a new Hawkwind album? I’ve had a few pairs of wish-trousers in the wardrobe for years too. Last month I ceded them to the local Op Shop (Thrift Shop to you, I believe). Enjoy your jeans and improved stomach condition Marty. Ding ding ding! Ten extra credit points for correctly guessing the American name of an Op Shop! Radioactive Breakfast would most definitely be a prog band with elements of both metal and ska influences. I await their arrival, Bruce! Seriously, glad you’re on a healing path. Hi Marty, as always you made me laugh, and Rich as I read it to him. Rich had gastritus, bleeding through the stomach wall, and nearly died! Similar to what you have, he can no longer take ibuprofen before taking other meds first, and asprin is a big no no as that’s what caused it in the first place! I am glad that you’re feeling better, and wear those jeans for as long as you can! Have a wonderful weekend . Ps the Incredible Hulk has vacated the building! Thanks, Moisy! It was really dumb of me, really. I just never paid enough attention when I should have. Fortunately the specialist thinks we caught this in time, so I just have to be careful from here on out. My sympathies and solidarities to Rich. Glad the Hulk has exited! Finally, a dissenting voice that fits how I feel about the jeans! I’m going to wear those suckers out of immense pride now (because between you and me, it certainly won’t be for style). Thanks, Judy! 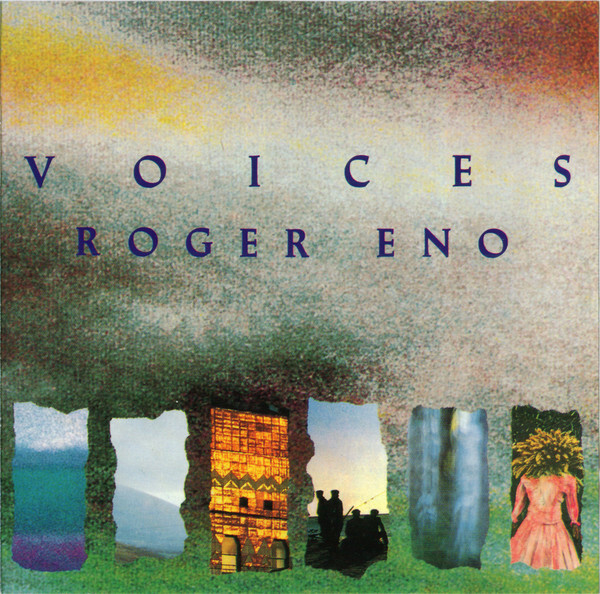 Roger Eno is Brian Eno’s brother?!?!? I had no idea! The internet is a cornucopia of useless information. You voluntarily ate radioactive food? Do I have that right? It seems so preposterous that I’m not sure I understand the premise of this post. I hope this food thing gets sorted out by Thursday. I almost wrote a parenthetical “Brian’s brother” to explain who he is, but then decided not to do so. Every article written about him probably has that included, and this blog with a low readership was going to let Roger stand alone on his own merits. I never *heard* of Roger Eno prior to this post. And I thought it was going to be just another dull Monday. Be careful of what you agree to do. Some things just aren’t worth the blog fodder they create. Marty, 1990’s jeans survived multiple moves? Please do not tell my husband as I made him donate all his size medium and large T-shirts during our last move – all 200 of them. He hates anything tight and wears XL T’s all the time – he is not in the same camp as you in weight loss. He’s also not as lucky in the kidney stones… we’re dealing with 3 right now. I say we, cause I’m there in the waiting rooms since treatment requires sedation. Anyway, I’ve done a radio-active treatment myself. They died my radioactive fluid blue. Bright cobalt blue. Created some interesting moments over the next 48 hours. Just saying. Seriously, very happy to know they found the source and it’s being dealt with. Turkey Day is upon us…you can’t be bloated with minimal food. That takes all the fun out of the overeating. I’m so sorry about your husband. I’ve suffered from kidney stones nearly all of my adult life, with fortunately some long gaps in between most of them. But last year at this time I had to have surgery to remove a particularly troublesome one, so the “all clear” I received on my one-year return was particularly nice to hear. But the strict attention I pay to a low-oxalate diet will continue for the rest of my life (I don’t cheat very much). My thoughts to your husband! So you’re a vet of the radioactivity too, huh?! Yeah, I guess it’s not for the squeamish. I think I got through the worst of it and am now back in one piece. Which is good because I’m hoping for TWO pieces of pie this Thursday. I finally found this post! … and of course from our earlier comment exchange I knew the outcome before I got to the ending. It is a fair warning though. Perhaps it’s time to change the meds. Right, Joanne. I was fully aware of the dangers of too much ibuprofen. But a former pharmacist neighbor of mine reassured me many years ago that the amounts I’d have to take for it cause damage were upwards of 10-15 pills a day. That astounded me because in no universe could/would I ever take so many. So I thought I was fine with the 2-3 I was taking. Apparently not, though. Over time it was creating a problem. The gastroenterologist I saw said to switch to acetometephin (i.e. Tylenol) and I should be okay. I’m now taking a grand total of ONE a day if I need it. Sorry for non weight loss on your end, but maybe that’s a better sign for you anyway. Thanks for reading this!